11:45 pm (Weds.) – 3:15 am (Thurs.). Asleep. 3:15 – 4:15 am. Awake. Too warm, and it seems I neglected to shut my brain off. Damn thing keeps worrying about stuff over which it has no control (or certainly not in the middle of the night). I resolutely keep eyes closed, and try to explain matters to the brain. Moderate success in calming it down, but now stomach is hungry. 4:15 – 4:30 am. Got up, went downstairs, had a banana, and half a glass of milk. Did three “Salute to the Sun” yoga manoeuvres. (I don’t really know much yoga, but that one works well for me.) Also turned down the thermostat by a couple of degrees. Then back to bed. 4:30 – 4:45 am. Still awake, but gradually fell…. 4:45 – 8:10 am. Asleep. 8:10 – 8:50 am. Ordinarily, I would go out for a run, followed by exercises (as on Tuesday and Sunday). Tuesday was colder (14 º F) than today (31 º F), but it was also drier, and I seem to have acquired a mild version of an illness from one of my students — yesterday afternoon’s quiz re-taker was recovering from a cough. I suspected as much last night, and so I drank an Airborne before bed. So, today will be exercise-free. (I don’t want this to turn into What Do (Sick) Professors Do All Day?!) Instead, I have written the preceding chronicle (which, since this is a work-related experiment, I am counting as work — if you disagree, then subtract it from the total at the end of the day). 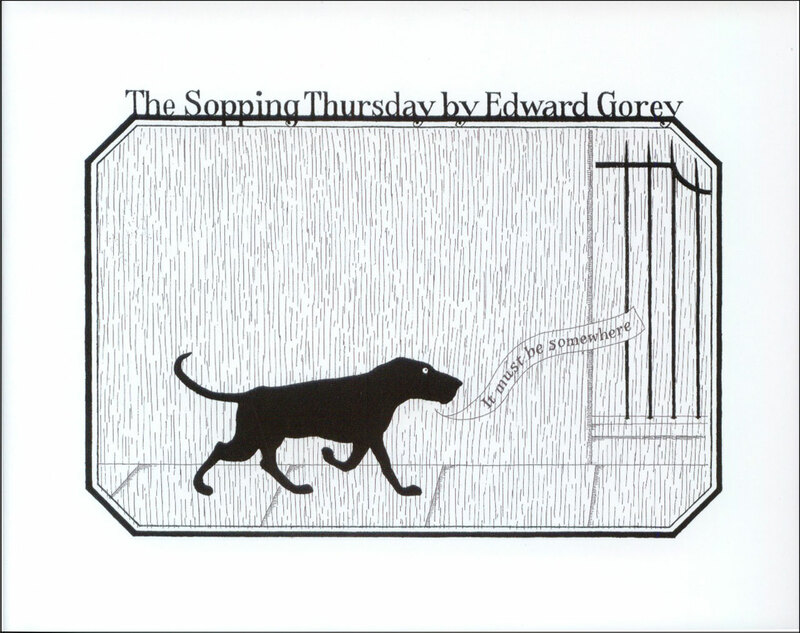 Also chose the image: looking outside, I think that Edward Gorey’s The Sopping Thursday may prove apt. 8:50 – 9:10 am. Breakfast, accompanied by first half of Malcolm Gladwell‘s “The Order of Things” (on the U.S. News college ranking system) in the current New Yorker. Thanks for the tip, Greg! Though I know it’s fashionable to mock Gladwell Industries Ltd., the man does great work. 9:10 – 9:40 am. Shower, dress, etc. 9:40 – 10:10 am. Facebook & Twitter. Learned of planned feature-length CGI film of Munro Leaf’s The Story of Ferdinand (the book turns 75 this year). Hmmm. Pleased to see Kansas Republican state senator Roger Reitz standing up for the arts. Maybe there is hope that the Kansas Arts Commission will survive, instead of being the first victim in Gov. Brownback’s war on culture. Here’s hoping! 10:10 – 10:20 am. Made a cup of Throat Comfort tea. Settling down to grade English 355 quizzes. 10:20 am – 12:20 pm. Graded English 355 quizzes (both sections), recorded first set. Also posted new question on English 703 message board. 12:20 – 1:00 pm. Lunch. Finished the Gladwell article, which I recommend to any of you affiliated with higher education. 1:00 – 1:15. Recorded grades for second set of English 355 quizzes. Also checked email. Nothing, I think, requiring my immediate attention. 1:15 – 1:20 pm. Facebook check! 2:30 – 2:45 pm. Relief. Had been waiting to hear back from a possible source for about 200 Barnaby strips. (This was one worry rattling around my noggin last night.) Heard back. All’s well. Whew! Wrote back, & also wrote back to earlier note from Eric @ Fantagraphics. 3:00 – 3:10 pm. Put away the Seuss rarities (& non-rarities) I showed to my English 355 class this week. Organized some material for the same class tomorrow. 3:10 – 3:20 pm. Graded one response paper for English 703. 3:20 – 3:30 pm. Twitter. Would love to see Elegant Enigmas: The Art of Edward Gorey at the Boston Athenaeum. 3:35 – 3:40 pm. Got a ride to campus (thanks, Karin!). 3:40 – 3:50 pm. Chatted with colleagues, but I can’t claim that the conversations were work-related. They were enjoyable conversations, but concerned Gov. Walker (in the first case) and the #@$! snow pelting down outside (in the second). 3:50 – 3:58 pm. Wrote the above entry. Printed out notes for Graduate Advisory Committee Meeting. 4:00 – 5:10 pm. Graduate Advisory Committee (GAC) Meeting. 5:15 – 5:20 pm. Homeward through the snow. 5:55 – 6:05 pm. Brief check of Facebook & Twitter. Also Barnaby email. 6:05 – 6:15 pm. In perusing the latest issue of the Children’s Literature Association Quarterly (36.1), I noticed that my review of Donald Pease’s Theodor SEUSS Geisel is in it. (That link will only work if you or your university subscribes to Project Muse.) Added my review to Reading Matters (English Dept. newsletter). 6:15 – 7:30 pm. Read more of Alan Bradley’s The Sweetness at the Bottom of the Pie (we’re into Chapter 5 now) to Karin, during dinner prep. Then, dinner with last night’s Colbert Report (Stephanie Koontz). After that, I made tomorrow’s lunch & washed what few dishes there were. 7:30- 7:40 pm. Answered survey for Vanderbilt University’s English Department — they’re gathering employment data for recent Ph.Ds… and, evidently, 1997 still counts as recent. 7:40 – 8:00 pm. Graded another response paper for English 703. Recorded this grade & the earlier one. 8:00 – 8:10 pm. Twitter. Enjoyed this: 5 Seconds of Every No. 1 Pop Single Ever (at BoingBoing). 8:10 – 8:25 pm. While listening to the preceding, readied & sent in Reading Matters. It’ll be out tomorrow or early next week. 8:25 – 8:30 pm. Still listening to No. 1 pop singles, attempted to prepare for tomorrow’s English 703. That didn’t work. Music stopped. 8:30 – 9:05 pm. Spent time preparing for tomorrow’s English 703. 9:05 – 9:30 pm. Break for some of that Throat Soother tea. Learned via Twitter that McSweeney’s is starting a children’s imprint. Auspicious news! 9:30 – 10:30 pm. Wrote another paragraph for “Radical Children’s Literature Now!” Also wrote more Complete Barnaby emails. 10:30 – 11:00 pm. Twitter open, quick reply to neocampbellite, who kindly notes that he finds this experiment useful. Will post link to this in abt half-hour. In an effort to get at least 7 hours of sleep (and shake this mild bronchial whatever-it-is), I’ll be turning in a little earlier. 8 and a half hours of work today, which is respectable — especially given that I haven’t felt 100% today. Tomorrow’s my final day in the panopticon. And on Saturday, I’ll offer some reflections on the experience — and answer any questions you may have. The rest of this series: Saturday, Sunday, Monday, Tuesday, Wednesday, Friday, & What Do Professors Do All Week? (the final post).